Michigan State has released its finalist designs for the new student section football shirt for this upcoming season, and the decision is in your hands. The front of the shirt has three options, all of which feature the Spartan helmet in some fashion. It's prominent on designs one and three, and fairly reserved on design two. 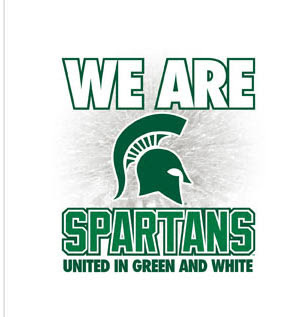 On the back are the words "We Are Spartans", a fairly familiar refrain, alongside"United in Green and White", which is a pretty new slogan for MSU. I can't recall it being used in any wide-scale effort over the past few years, and it's certainly not part of the casual fan's lexicon. While the front three designs could all be said to be variations on the same theme, the back three are pretty different. The top has MSU's 2009 schedule, the second is just simple block lettering, but the third is easily my favorite. Hence why it's pictured. Vote now - the polls close on July 17.